that killed an estimated 2000 small fish. Officials said there’s no further significant threat to the creek. 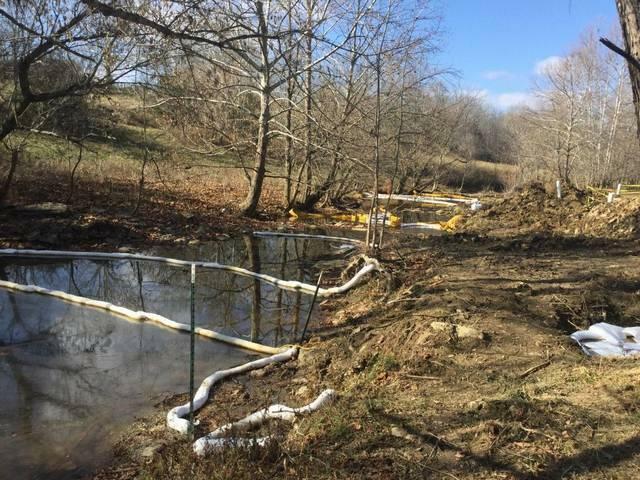 State and local environmental officials are searching for the source of the 3,000 gallons of biodiesel that made its way into the waterway. State Natural Resources Spokesman Lanny Brannock said the exact cause is not known although a nearby Love’s Travel Shop is being examine. “They’ve shut the system down and we’re continuing to do testing to figure out where the leak is coming from for sure, even though, we almost know for sure it has to be this tank,” at the truck stop, said Brannock. Brannock said Love’s has installed aerators downstream to prevent future leakage. Scott County Emergency Management Director Jack Donovan said a cleanup company is checking nearby soil to make sure any biodiesel is flushed through. Biodiesel, with a cooking oil-type consistency, is not a toxic substance. The fish kill was tied to a lack of oxygen.